A hospital bed is a bed designed specifically with those who are suffering from illness in mind. This may also include people who are recovering from having surgery and those who find mobility difficult. Hospital beds in Australia are primarily found within the hospital setting but may also be found within the home setting for older people who may require daily care and who may find it difficult getting out of bed. Are there many different types of hospital beds? There are many different types of hospital beds and it is easy to find hospital beds in Australia that cater for whatever need of one who is poorly. For example, it is possible to find electronic hospital beds that can be controlled electronically by whoever is occupying the bed. They will be able to change the way that they are positioned, making them a lot more comfortable. This may involve sitting up, lying down flat or raising their legs to help improve circulation if they have been lying in bed for a while. There are many other types of hospital beds in Australia, including low beds and gatch beds, circo-electric beds and clinitron beds. What are the advantages of a hospital bed over a regular bed? There are many advantages of a hospital beds over a regular bed. One of these is comfort and the measure of independence that a hospital bed may give to its occupant. For instance, a patient in a regular bed may have to wait long periods of time in an uncomfortable position as they do not have the power needed to move themselves into a comfortable position and may have to wait for someone else to come and see and help them. With a hospital bed, the occupant has independence and is able to control their own comfort level. Another great advantage is that of safety. 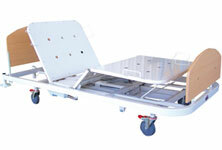 Many hospital beds come equipped with rails that may be put up either side of the bed. This may thus help someone not to fall out of bed and cause further complications to their health. This is something that may be entirely possible with a regular bed. Thus, a hospital bed not only provides a greater level of comfort to the occupant but also gives family and close friends peace of mind in the knowledge that their loved one is safe and secure. Are hospital beds easy to find and purchase? It is easy to find hospital beds in Australia for sale. However, these hospital beds may be expensive, especially if they are specifically designed for a particular person and are bought brand new. It is for this reason that many people opt to buy second hand hospital beds that are widely available, easy to find and are a lot cheaper than a brand new hospital bed. Hospital beds in Australia are more than just a bed – they are a way to ensure a loved one is comfortable, safe and happy.